And it's not at all bad news. Car insurance. It’s illegal not to have it, and many people buy cars based on what the insurance rate will be; it’s completely reasonable logic. Unless you’re swimming in cash, your annual insurance rates matter. But don’t think for a moment that the most boring cars are always the cheapest to insure. Many factors are involved to determine the rate, and The Detroit Bureau has just compiled some numbers from Insure.com and discovered that the average premium for the US is $1,555, although this varies depending on which state you live. So what’s the least expensive vehicle to insure in the US? The Jeep Wrangler Sport 4WD. 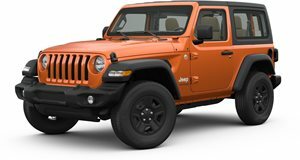 It turns out the Wrangler can cost as little as $694 (in Maine) annually, or as much as $2,027 (in Michigan). But the average rate in the US is $1,134. That’s even cheaper than the Smart ForTwo Pure ($1,186) and the Dodge Grand Caravan SE Plus ($1,162). And with all that, go buy a Wrangler.